Angels above and demons below. 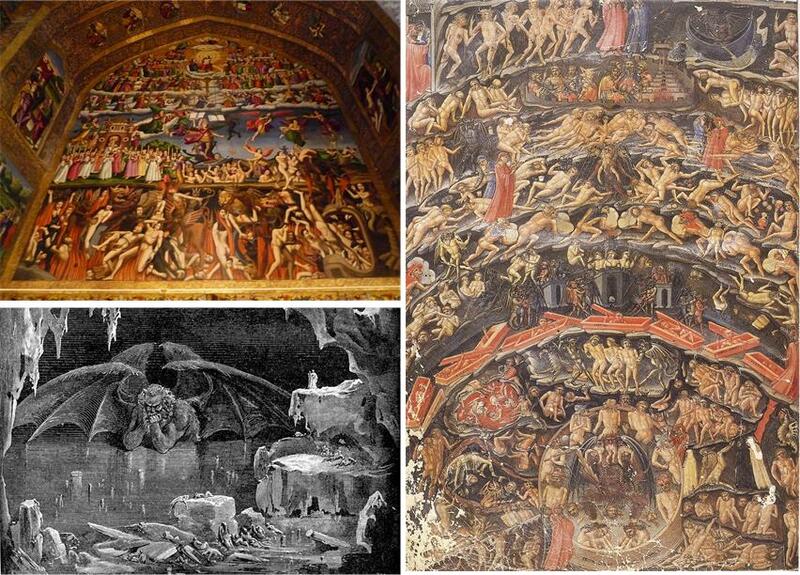 Most of us have seen Old World depictions of heaven up in the sky and hell down below, inside the Earth. I guess it makes sense. Carnal minds like ours, trapped in three-dimensional living, can’t perceive the subtle realms that flourish all around us. They’re as invisible to us as radio signals… separated from us and from each other not by space but by vibration… all beyond the range of our five senses. Since the diverse worlds of spirit are beyond our view, our minds naturally want to place them way out in space and deep underground. 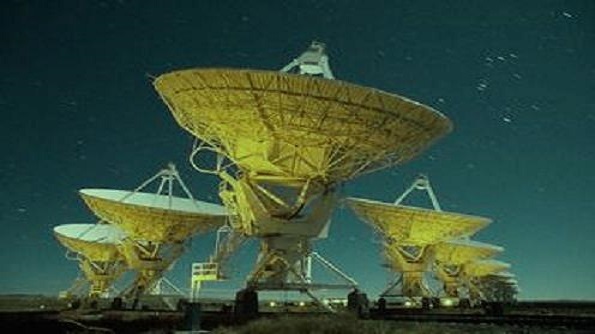 Even most of our the great scientific minds today find it more reassuring to gaze outward among the stars in their search for extraterrestrial life, than to explore in-beyond of our world where angels, spirits, and ghosts really dwell. Science has developed equipment to detect and measure radio signals and other electromagnetic energies, but only out on the fringes of science are technologies beginning to detect the spirit worlds (see some examples here)… so, again, it makes sense that mainstream science even today remains blind to the vast realms of spirit. Bottom line: it’s the restricted human mind that compels us to look in the wrong direction—out into space—for God, angels, and other intelligent life. That, and our bipolar nature. Humanity is by nature bipolar. We observe the many forces around us and within us… some pleasant and creative… others unpleasant and destructive… and we label them good and evil. The endless dramas of planet Earth are highly complex, thanks to the rich noble-savage forces within us and around us, and a simple moral compass makes them easier to navigate. We can label each force either good or evil, and live our lives accordingly. And that’s why we look upward for Heaven, and downward for Hell; it’s simpler… at least that’s what I’ve always believed. Now, after a dream I had this past Tuesday, around 1 am, I’m not so sure anymore. The dream made me do some serious thinking this week, and I think I’ve come up with a better reason why Hell or purgatory has long been envisioned within the Earth. First I’ll describe the dream, and then I’ll explain how it changed my understanding. It was one of the most lucid and realistic dreams I’ve ever had. It took place about a half-block north of the big two-story house in the small town where I grew up. There was a portal on the ground—a circular area, maybe four feet in diameter, in which the ground was partially transparent and shimmering. I could see the portal, and the psychic friend with me could see it too. Somehow I felt responsible for the portal… my being there. The psychic stepped into the circle and disappeared, going down into the portal. I was still in touch with him, and he said it was dark down there. Off in the distance he said he could see a yellow light. Otherwise it seemed pitch black. He came out and went down a second time sometime later, maybe the next day. He wanted to stay down and explore a bit. Again it was dark with a golden light in the distance. At last the psychic came back up from his second trip down, so I could now go down. I stood on the portal and descended into the other world. I could see the golden light in the distance, but it didn’t seem reassuring to me. It was just a dim little light far away. I stayed down longer than the psychic had. After a while I became acclimated and could see people living there. The area was no longer in darkness, but looked like the interior of a sprawling home in incandescent lighting. The people looked just like a bunch of young people on Earth—not really scraggly or dismal, as I might have expected. If anything, the guys were more clean-shaven than what seemed normal to me here on Earth. Two or three couples were in the living room area, which is where the portal entered their world. They were setting up beds apparently to turn it into a lounging or resting area. I walked beyond the living area, toward the light, and found a blond, casually clothed fellow sitting on a bed, not moving. So, as I suspected, he’d passed on and was living in an astral world. From his presence and his discussion it became apparent that he and the others there had died with unfinished business. That’s why they were hanging out in this little community near the Earth. It felt like it was underground, since I’d entered downward through a portal. In any case, this fellow said that before he died he’d sold his gall bladder to someone for $30,000, which the other person had paid him. But then he died and could no longer give his gall bladder to the recipient… so he was kind of stuck. At least he felt stuck by his inability to honor his debt. Someone in the community mentioned that off in the distance was the “Rat King,” who was apparently an overseer of this particular domain where they were living at the moment. I’m not sure about the significance of a Rat King in the dream… maybe an association with the “Nutcracker” musical that’s always so popular this time of year? It felt like a real spirit realm I was in during the dream, a sort of purgatory where people were stuck for a while after they died… not really unhappy, just a little anxious about having some unfinished business. Here’s what I think is happening. There’s a “shadow world” surrounding the Earth like fuzz on a peach, inhabited by many people who didn’t make it to paradise after they died. They’re stuck near the Earth and its dramas for one reason or another. But the shadow world isn’t exactly like peach fuzz, which adheres neatly to the surface of the peach. As a spirit world, it doesn’t conform to material structures like planets and is not affected by physical forces such as gravity. It’s more like a cloud surrounding much of the planet, extending a ways “above” the planet’s surface, and also penetrating inside the planet. You could say it “loosely conforms” to the surface of the planet. I suspect that when psychics have gotten glimpses of the shadow world down through the ages, the activity sometimes seems to be happening underground… as in my dream. Long story short, that could be another reason why we’ve come to envision purgatory and hell inside the Earth. This seems even more interesting when you consider that many psychics have told you about the portal on the ceiling in the southwest corner of your lab – the one that our friends in the relatively-finer astral realms have utilized to stay anchored to our world! So… what I’m learning from this is that a portal between ‘heaven’ and Earth can be a wonderful thing, as long as everyone’s in harmony with a lot of love and friendship and mutual respect. But when human relationships turn savage, the portal becomes less of a blessing. The “personality” of a portal evolves with the noble-savage flow of human relationships. Truth indeed seems stranger than fiction! I’d like to work on astral-travel abilities. I’ve tried, but it seems like it takes a lot of time to learn…some day though. I agree, those gifts come more naturally to some than to others. Anyone can develop the technique through refinement (polishing up the noble side of our nature), e.g. heart meditation on a regular basis while getting into a space of love and friendship with spirit. As you say, it does take time for most of us… something we on Earth seem to have a lot of. There’s also “remote viewing,” which doesn’t rely so much on attitude. You just move through very dense spiritual realms (the shadow world) to see various locations on Earth. Astral projection can move you to finer realms, but you have to resonate with those realms in order to get there… and that involves refinement of the noble-savage qualities to become more noble. PS – both astral projection and remote viewing (as well as meditation) involve getting the mind into the dream state or alpha state, what the Monroe Institute calls body-asleep-mind-awake. It’s basically enjoying dreamy excursions into the spirit realms while bringing the conscious mind along for the ride. PSS – Deeper meditations can take you to deeper levels (‘delta’ and ‘theta’), where you move beyond the astral realms into ethereal realms… beyond form and structure, to pure loving consciousness. This entry was posted in After we die, what then?, Heaven and Earth, Inner exploration, Other-worldly matters, Science and Technology, Spiritual realms and tagged dreams, heaven above hell below, hell underground, where is heaven really. Bookmark the permalink.